A railway group is appealing for volunteers to help complete a restoration project in Derbyshire within the month. 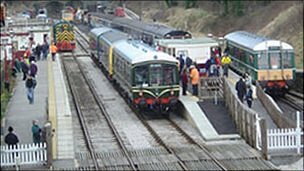 Ecclesbourne Valley Railway has spent 10 years reopening 10 miles of track. A spokesman for One-last-push.com said if they fail to finish on time they will have to pay thousands of pounds for a private safety inspection. Government rules on heritage railway inspections change in September with the work being done by consultants. The Ecclesbourne group said it had already replaced 4,500 sleepers and had a further 728 to change in the next three weeks between Wirksworth and Duffield. The railway volunteers, who are being helped by WyvernRail plc, are also renovating the station at Duffield. Railway spokesman Neil Ferguson-Lee said: "The extra cost could run to £10,000 or more as they will inspect the track, the station, the fencing and everything to do with the safe management of the railway. "If we finish it by September, that work can be done for free by HM Railway Inspectorate."